Physical Description Average-tall height, with a stocky build. Thick brown hair, parted at the centre, just within regulation length. Occasionally sports a light beard. Lost his right eye several years ago - it has been replaced with a gold-iris prosthetic. Personal History Michael Turlogh Kane is a man who dwells on odds and chances. As a child, he endlessly plagued teachers with questions on time paradoxes, multiphasic phenomena, alternate realities and the like. An almost physical aversion to mathematics ruled out the sciences as a field of study, which was fine by him. Through a love of history, he discovered wargaming, and moved on to advanced strategy games like 3-D chess and Strategema. When the time came, and he had decided to join Starfleet, he knew exactly what he wanted to be - a Sec/Tac Officer. His high scores in Starship Combat Tactics earned him a semester at the illustrious Zakdorn Institute of Strategic Studies. It was during his time at the Academy that Kane came to passionately believe in the ideals of the Federation, and was reprimanded once by an instructor for publicly advocating war with the Romulans after the Incursion. This led to his minor in Xenocultural Studies. He is familiar with most of the cultures of the Federation, and has deeply studied the history and cultures of outside powers. He remains a friendly, affable man that seems a little self-conscious upon meeting new people, but has been noted for a quick wit and a ready joke when amongst friends. He appears a little aloof while on duty, and sometimes drinks too much while off. His rather casual manner towards life can be irritating to others. Kane was delighted to graduate from Advanced Command Training, and his transfer to the USS CENTURY was excellent news, but the whims and flippancies of youth quickly disappeared. On Stardate [2.0] 1210, he, along with two other crewmates, was almost killed when their shuttle fell into the inner corona of the Aridian star - he was very badly burned and spent many weeks having a new epidermal layer grafted onto his skin. On stardate [2.1]0420 he was seriously wounded in personal combat against a Klingon pirate - he now has a prosthetic spleen and two metres of polymer in place of his small intestine; and during the savage climax to the "Harbinger" epic, he almost died from hypothermia after becoming trapped in a flooded elevator shaft. 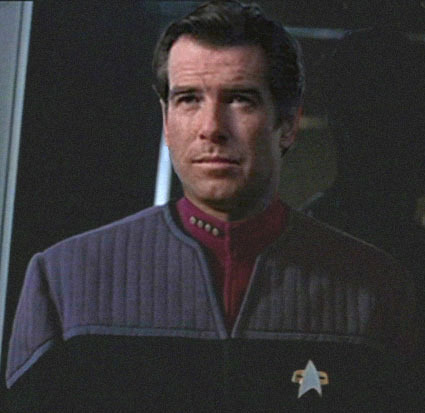 Kane resigned from Starfleet for a short time in 2416; after enduring a dark night of the soul prompted by the death of his father, he returned to his former position in the fleet, and was shortly afterward promoted to the position of Executive Officer aboard the newly-activated USS DISCOVERY. He and her crew became Starfleet's first deep-space explorers in half a century, but the voyages were not without incident. Kane was captured by the Calnarians at the beginning of the SAVAGE STARS trilogy and spent six months in a mining camp on the hellish world of BYSS, during which he was subjected to daily torture and mistreatment, leading to his slaughter of twenty thousand Calnarians by detonating an antimatter reactor to gain some sort of revenge. Kane was reassigned as commanding officer of Gateway station, but after a short time was removed from the station by the Prophets. He resigned from Starfleet and disappeared into the Long Night. Eight years later, while he was living on Vulcan, Richard Edgerton brought him out of retirement to take command of the DISCOVERY once again ("All Our Yesterdays"). Edgerton hoped t recruit Kane into the Neo-Essentialists, but the destruction of the DISCOVERY in system K-60 marked Kane and his crew as mortal enemies of the Neo-Essentialists. Along with his crew, Kane fled Earth during the Neo-Essentialist takeover of the Federation government. He remains in command of the USS PHOENIX, the command ship of the rebellion against the Neo-Essentialist regime. Kane also holds civilian degrees in history and literature.